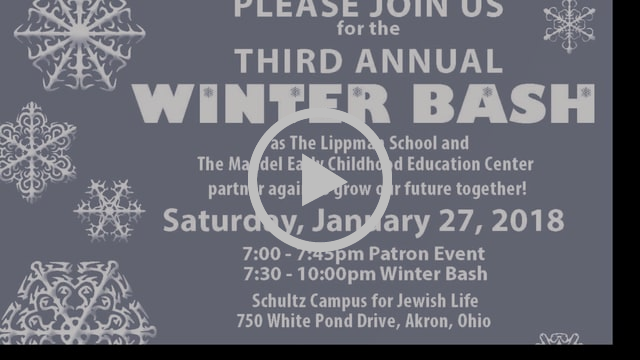 We’re very excited about the upcoming Winter Bash event, Saturday, January 27, a collaborative effort between The Lippman School and the Mandel Early Childhood Education Center to help grow our future together. This annual fundraising event is crucial to maintaining the amazing learning environments that we have come to love and expect from both organizations. The proceeds from the Winter Bash help keep class size small and provide materials and resources to enhance curriculum and enrich religious experiences. Arrive early for our Patron Event, 7-7:45 p.m., featuring Just Go With It Improv, a fun and energizing improv group showcasing the talents of local artists. Patron tickets are $75 and include champagne, appetizers, full menu, two drink tickets and program listing. General admission to the Winter Bash begins at 7:30 p.m. with a full menu and cash bar. Nervous Dog Coffee will sponsor a complimentary coffee bar. Winter Bash will offer many opportunities to support both schools including a silent auction featuring more than 50 items to bid on. We will also have many items available in our raffle as well as a Wine Wall and Wishing Tree! New this year, we are offering "Sign-up Parties" - and they are so many different themes to choose from. Some are for adults and some for children. Details will be provided at the Winter Bash. Don’t delay – registration ends on Monday, January 15 at 5 p.m. If you’re already registered, thank you! If you are unable to attend the event, donations to the Winter Bash can be made in advance online or by calling 330-836-0419. If you're a J-Ticket participant, we encourage you to use your program voucher to purchase event tickets, even if you cannot attend! It's a New Year! Get a Fresh Start at The J!